Private Reserve Schmidt P8120 Capless Rollerball refill. Short roller ball refill by Schmidt . Schmidt Capless System is newly developed for the most smooth and elegant writing. This system combines the individual writing character of a fountain pen with the problem-free handling comfort of a ball pen. Metal tube with tampon system, stainless steel tip with 1.0 mm ruby ball. 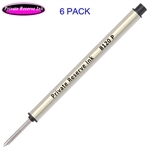 · Private Reserve P8120 black ink Broad tip capless rollerball Refill. · Private Reserve P8120 blue ink Broad tip capless rollerball Refill. Lanier Pens is your source for all Private Reserve Pen refills including the popular Private Reserve P8120 Capless Rollerball Refill.